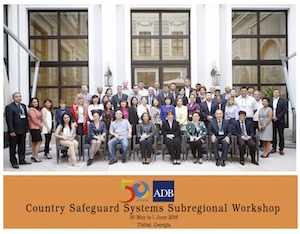 ADB held the Country Safeguards Systems Subregional Workshop on 30 May to 1 June 2016 in Tbilisi, Georgia for representatives from 11 DMCs in Central, West, and East Asia. Over 60 participants from governments, civil society, ADB, and development partners attended the workshop. Organized by SDCC with support from CWRD and EARD under TA 7566 for Strengthening and Use of Country Safeguard Systems, the workshop aimed to highlight lessons, challenges, and opportunities in addressing the environmental and social risks and impacts of projects through safeguards; identify specific gaps and challenges in applying CSS across the subregions, and determine possible approaches in bridging these gaps. GRM CD Yesim Elhan-Kayalar delivered the opening remarks while SDES Principal Social Development Specialist (Safeguards) Indira Simbolon officially closed the proceedings.